Susan Marie Swanson is a poet and picture book author fascinated by the place where her understandings about poetry, children�s own writing, the lives of children, and children�s literature converge. Growing up in a small town on the edge of the Chicago area, Susan Marie loved visiting the public library and the bookstore. Both were within walking distance of her house, her school, and a bakery with really good sweet rolls. Her first publication was a poem about snowflakes, published in the weekly town newspaper when she was ten years old. Besides writing poetry and picture books for children, Susan Marie has been writing poetry with children for more than 25 years, teaching in the COMPAS Writers and Artists in the Schools program and in summer arts programs at St. Paul Academy and the Friends School of Minnesota. 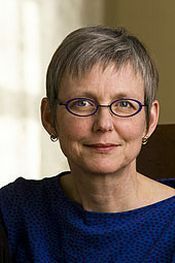 Her awards include fellowships in poetry from the Bush Foundation, the McKnight Foundation, and the Minnesota State Arts Board, as well as the McKnight Artist Fellowship in Children�s Literature. Susan Marie lives with her family in a St. Paul neighborhood known for its small-town feel, within walking distance of a branch library, an independent bookstore, and a bakery with really good sweet rolls.